Because our cocktail space and our reception space are one and the same, I wanted to include a lot of little things for guests to do in a small amount of small. 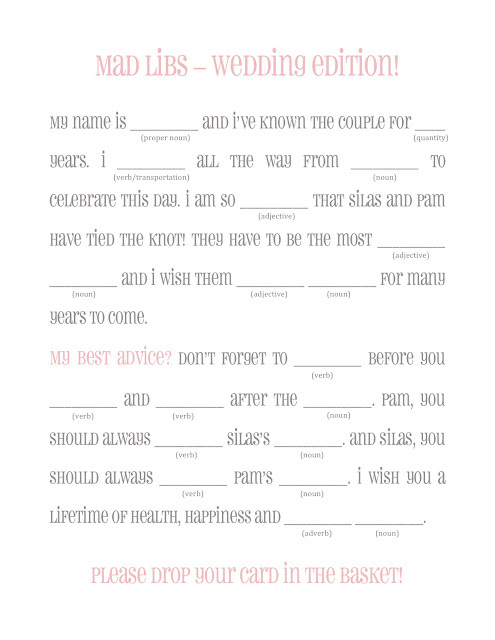 While browsing Pinterest one day, I saw a "wedding mad libs", and decided to go for it myself. Along the way, I also put together a crossword puzzle for our guests. These will be available at each place setting, and hopefully keep our guests occupied while we are away in the gardens having photos taken! I basically copied word for word the original mad libs I found on Pinterest, and substituted our name, using the same font as our wedding invites. I put this together in Publisher, because word was giving me weird spacing issues with the tiny parts of speech for each blank. I'd be happy send the template, so if you're looking for one, just leave your email in the comments, or PM me with your request. Second, the crossword. This one was more difficult! I started out with only 10 questions, but couldn't quite get it to look the way I wanted. Eventually, you can see that we ended up at 16 questions, which gave me approximately the look I wanted. (If you're looking for an online generator, I just googled "crossword puzzle creator"). Then, I took the completed puzzle, and changed the colors from black to the gray used in our invites. Are you including any games for guests on your big day?